It’s officially been fall for a few days now and I can’t say that I mind. I always welcome the cooler weather and this year is no exception. I even have a new pair of brown corduroys in my dresser drawer that are calling out for a long fall walk in the woods with the camera, (perhaps wearing one of these? Love them, must order one!). However today’s rain (and wind warning), not to mention a case of the sniffles, has kept me indoors. Not surprisingly, as a devoted lover of almost all things Autumn, pumpkin is one of my most favourite flavours so I don’t really mind that it seems to be everywhere: as soon as Labour Day passes, every bakeshop, coffee shop and restaurant adds this iconic squash to its menus. Lucky me, it is only a matter of weeks before my Uncle Rick will harvest the pumpkins from the pumpkin patch that crawls around the front garden of his house and make is famous pumpkin pies for Thanksgiving. Light as air and boldly spiked with bourbon, his homegrown pumpkin pie in home made pastry is dessert perfection. Seriously though, I likely won’t be making from-scratch pumpkin pies this year, but I am certainly following suit with plans for a savoury sage-laden pumpkin ravioli, pumpkin soup and a pumpkin trifle, all of which I will share here in the coming weeks. 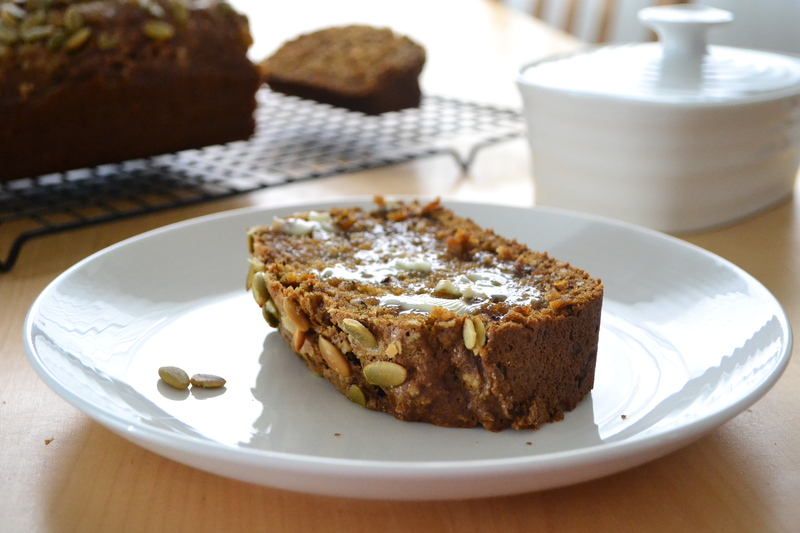 Until then, I have this sturdy pumpkin loaf to share. 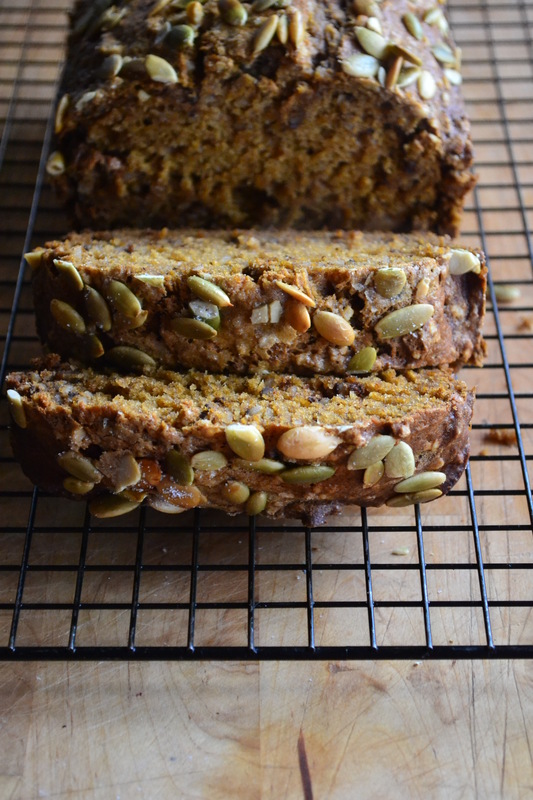 It’s nicely spiced with a clean, bright pumpkin flavour and the recipe is large, yielding 2 hefty loaves so there is plenty to share (or freeze for yourself for later). I hope you enjoy this recipe, woolly socks and hot tea, optional. Bake for 1 hour or until a skewer inserted in the center comes out clean. Allow to mostly cool in the pan then turn out onto a wire cooling rack. September : Where does the time go?